Our school is embarking on a special project, an all-school book club called Texas Reads One Book. On Monday, April 15th, we gathered at a special assembly to watch Dallas Cowboys Head Coach – Jason Garrett – read the first chapter of a children’s book, Betty G. Birney’s Friendship According to Humphrey. Many elementary schools throughout Texas are participating in this event, and your family is invited to attend and join thousands of others in this statewide reading celebration! In school, your child will be invited to answer daily trivia questions to encourage and reward attentive listening. You will soon find that your child will take pride in knowing and anticipating the details of the story. In class, we’ll be exploring the book through a variety of activities. You will want to make sure your family keeps up so that your child can be included. 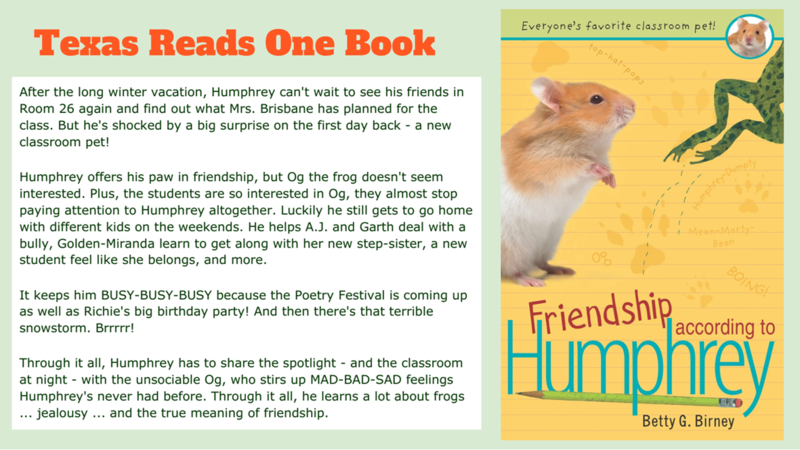 During this event, everyone will be talking about Friendship According to Humphrey! Texas Reads One Book is a unique program in which children at all elementary grade levels will read the same book. This approach makes sound educational sense. Reading professionals realize the benefits of reading books that are beyond a child’s own reading level. You can and should continue reading chapter books with your children, even when they are older and able to read by themselves. Through the Texas Reads One Book program, we are working to build a community of readers at our school and throughout our state. Everyone – students, parents, teachers, even support staff – will be participating together.